His Beatitude, Metropolitan Tikhon is one of several Orthodox Christian and other US religious leaders who has been invited to attend an interfaith gathering at “Ground Zero” here on Friday, September 25, 2015, the fourth day of Pope Francis’ six-day American tour. 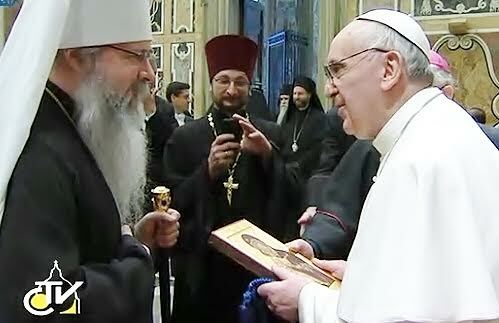 Metropolitan Tikhon congratulates Pope Francis on his Inauguration in March 2013. Accompanying Metropolitan Tikhon will be Archpriest John A. Jillions, Chancellor of the Orthodox Church in America. The gathering will take place at the National September 11 Memorial and Museum. Outside the museum, Pope Francis will meet with relatives of those who perished in the 9/11 terrorist attacks on the World Trade Center. The site of the new Saint Nicholas Greek Orthodox Church, which will replace the historic original structure destroyed in the attacks, is in close proximity to the museum. Metropolitan Tikhon was one of a number of Orthodox hierarchs, including His All-Holiness, Ecumenical Patriarch Bartholomew, who attended the Inauguration of Pope Francis in Rome on March 19, 2013. See related stories here and here.